These lenses are mostly redesigns of the Distagon and Planar lenses that formed the ZF.2 line, using Zeiss’s new modern curved look and more visible markings. Four of the new lenses are basic redesigns, a bit smaller in overall size, yet heavier than the originals. The 50mm f/1.4 goes from a Planar to Distagon design and is larger, and the 85mm is also larger than its ZF.2 predecessor and completely redesigned. 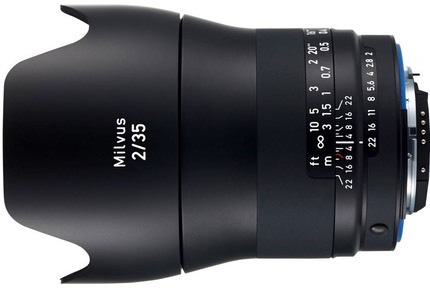 All of the Milvus lenses include Zeiss T anti-reflective coating and use new low dispersion glass for some elements. The aperture ring on the lens is “de-clickable,” meaning that the click stops for apertures can be removed for continuous and smooth aperture changes for video. All the designs are weather-resistent with internal seals to guard against moisture and dust, plus a seal at the rear of the lens that protects the camera/lens connection at the mount. One has to ask this: if Zeiss can completely redesign an entire lens set and get them supporting video, why can’t Nikon do that with the Nikkors? By the way, I find it curious that in the photos Zeiss publicity provided the press I could see some clear, though narrow, chromatic aberration visible.